what will be the source of these bulbs...? farhan137 wrote: what will be the source of these bulbs...? There are lot of UK bulb vendors. I can use shipping address of UK, some of my friends from UK will bring then to pakistan. Just trying to find a vendor who could allow non-UK billing address. In USA, there are lots of vendors but they do not ship outside USA. 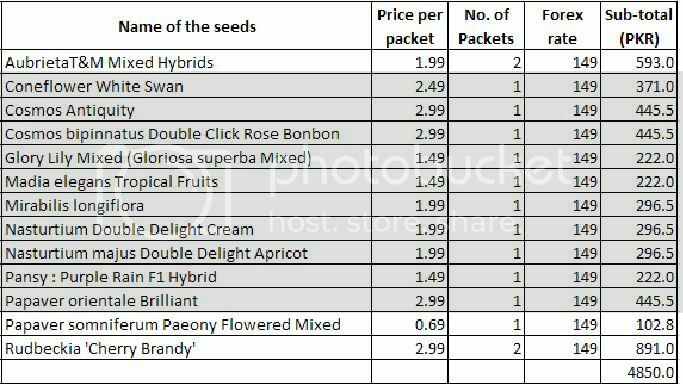 Those who want to buy seeds from Thompson Morgan, kindly send their seeds list to me or post in this thread. As soon as the offer of 50% will start, we will buy seeds. So hurry up and post your wish list. I think 50% off Offer might not come in coming weeks. I think we can go for any other offer like free P&P or 10% off. What do you say, Sysed Adnan, Izhar? do you remember when 50% off was offered last year?? This year they did it in May. I think the next one will be in Christmas not sure about last year.. Planting time does not start from October mid i think so we have some time but not much. We can wait a bit ..... also i have to check how the seeds shall reach me can only happen if someone is coming from PAK in NOv. We will be in touch.